Somewhat of a market place and square, Cours Mirabeau is where people, both native and travelers, flock for a dose of fun. The various cafes lining the side streets bustles to life everyday, where you can stop by and dig into some delicious dishes observing the crowd. Ensure to visit its most famous Les Deux Garcons while you are at it. The place has been well known since the past as it was a popular destination for many of the prominent figures. There are various shops for people to shop from along with sidewalks lined with plane trees. Not to mention, it has beautiful fountains such as Fontaine de la Rotonde which has been no less of an inspirational piece for art lovers. In all, Aix-en-Province is a must visit for tourists, especially for those who wish to witness the country’s culture closely. How popular is Cours Mirabeau? People normally club together Vieil Aix and Hotel De Gallifet while planning their visit to Cours Mirabeau. 440 meters long and 42 meters wide, the Cours Mirabeau is one of the most popular and lively places in the town. It is lined with many cafés, one of the most famous being Les Deux Garçons and during its history frequented by famous French cultural figures. By 1696 four fountains had been built : Fontaine des 9 canons, Fontaine "Moussue, Fontaine du Roi René and, to the west, "les Chevaux-Marins", now vanished. Delightful in the sunshine, exactly what anglophones imagine France to be. Top tip tho, take a Credit Card! Lovely to relax, walk or shop and drink something whilst watching the going ons. The ultimate walkway in Aix. Several markets per week are along the Cours. The Christmas market is very special and is a must visit. Many restaurants are along the walk as well as many banks. The walk is always pleasant and pedestrian friendly. 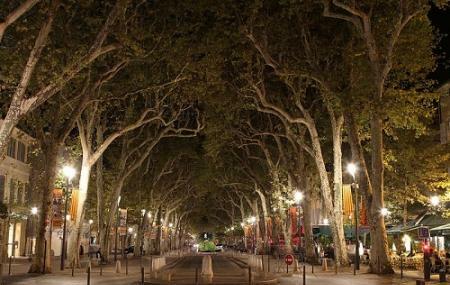 It is the heart and soul of Aix-en-Provence.